The facsimile etching Your Fate was released in 2005 along with the image Columbine as a folio set. Image size was 14.4 x 11.7 cm. Etching House was the only one to break the set selling images separately. The edition was 550 and sold out recently with exception to the few in our archive stock. Columbine and Your Fate were released in 2005 as folio set. The folio contains, as well as the two Facsimile Etchings, a brochure with details of the two books – Colombine and The Etchings of Norman Lindsay in which the original etchings of Columbine and Your Fate are included and also the essay ‘The Craft of Etching’ by Norman Lindsay. The Etchings of Norman Lindsay, published in London, remains one of the most tantalising collections of Norman’s work. Constable & Co., publishers of fine limited edition books, were aware of Norman’s etchings as early as 1922 when they were the London publishers for Art in Australia. In 1925 they had further evidence of the quality of the work when Norman held an exhibition at London’s Leicester Galleries. Although the exhibition was not a critical success, the etchings were popular. 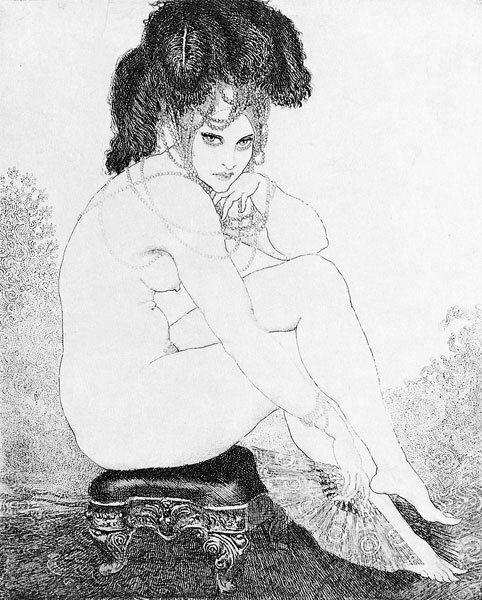 The Etchings of Norman Lindsay is a handsome volume with each plate presented full page, with a cover page indicating the plate number, title and date. As well as the forty-five reproductions, both editions contain a chronological list of the eighty-four published etchings from 1918 to early 1925. Several etchings published late in 1925, and some done during the 1918-1925 period which were not put on the market until later, are therefore not listed. The reproductions, in alphabetical order, are as follows: Adventure, The Apex of Life, Argument, Ballet Entrance, Bargains, Beauty’s Fortune, The Black Hat, The Blind Man’s Wife, Courtesan, Dance, Death in the Garden, Death of Pierrot, Debut, Delight, Desire, The Dream Merchant (2nd Edition), Enter the Duke, Femininity, From the Moon, The Funeral March of Don Juan, Good Morning, Goodnight, The Happy Barge, Hyperborea, Julia’s Monkey, Lands of Afternoon, Little Scandals, Madam Mystery, Micomicon, The Mirror, The Ragged Poet, The Ring, Scherzo, She Arrives, The Showman, Siesta, Song of the Faun, Sortie, Spring Song, The Terrace, Toilet (1920), Two Lovers, Unknown Seas, The Windmill and Who Comes?. Norman was delighted with the quality of the reproductions. For many years, books illustrated by Norman have been broken up for the illustration, which has had the effect of making the original book rare. In 1938 The Fine Art Society’s Gallery in Melbourne held ‘An Exhibition of Reproductions of Etchings by Norman Lindsay’. The reproductions were taken from The Etchings of Norman Lindsay. The original Your Fate was done by Norman lindsay in, image size is 14.4 x 11.7 cm, it was published in the low-edition volumeThe Etchings of Norman Lindsay in 1927. The etching is a perfect example of Norman’s control of the etching needle in the clear lines of the body and intricate details of the delicate pearl head-dress contrasting with the deep black of the cushioned seat on which the beautiful personification of Fate rests.